Dr. Cynthia Campbell is a research scientist at the Division of Research, Kaiser Permanente Northern California, conducting research on the treatment of substance use and mental health problems. She is also an Adjunct Associate Professor in the Department of Psychiatry, University of California, San Francisco. Her interests include access to treatment, chronic pain and substance use, prescription opioid use and misuse, adolescent behavioral health, benefit design and cost sharing, and organizational factors and policy related to these areas. 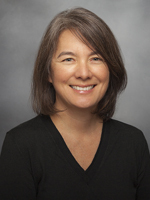 She is currently the principal investigator of a NIDA-funded study examining the impact of the ACA on addiction and HIV services, a NIDA-funded study examining substance use service intensity for buprenorphine patients, and a PCORI-funded study of a patient activation intervention in primary care for chronic pain patients starting long-term prescription opioid use. Her work also includes the assessment of attention deficit hyperactivity disorder (ADHD) in children. She received her doctorate in Public Health at the University of Michigan, and conducted her postdoctoral work at UCSF in a NIDA-funded fellowship on Substance Abuse and Health Services. ​The goal of this Food and Drug Administration-mandated study is to provide quantitative estimates of the serious risks of misuse, abuse, addiction, overdose, and death associated with long-term use of opioid analgesics for management of chronic pain, among patients prescribed extended-release and long-acting (ER/LA) opioid products. Patients will be recruited and interviewed across several health system sites. ​Building on past research, this project will establish the infrastructure to expand a prescription opioid registry across diverse health systems in the Addiction Research Network. Harmonized electronic health record data elements will be used to examine how changes in opioid use are associated with other patient outcomes, such as emergency department service utilization, benzodiazepine use, and use of other non-opioid medications (e.g., nonsteroidal anti-inflammatory drugs [NSAIDs] and gabapentin), and how this may vary by patient characteristics and across health systems. This study will survey a sample of patients with pain about their use of medical marijuana. The goal is to describe patterns of use, mode, medical conditions, or symptoms for which medical marijuana is used, as well as perceived benefits, side effects, and patient experience of communication about its use with providers. This cooperative agreement supports addiction research in 15 health systems from across the U.S. by establishing the Health Systems Network (HSN) node of the NIDA Clinical Trials Network. HSN research includes a range of study designs and settings, but emphasizes integrating addiction treatment into medical settings and health systems. This randomized trial is based in primary care and focuses on management of prescription opioids among chronic pain patients. The intervention uses a patient activation approach to self-management for these patients and to link them to existing health plan resources. This study is a randomized trial of adjunctive substance abuse services in combination with buprenorphine treatment for opioid abuse/dependence. We will examine treatment as usual vs. case management/telephonic support, and outcomes of medication compliance, substance use and psychiatric severity. To examine the impact of the ACA on treatment for individuals with drug use disorders and who are HIV+. We will examine how this population changes after 2014 enrollment, and subsequent substance abuse treatment and HIV treatment utilization. We will examine findings for different coverage groups, and explore organizational response to changes in this population. The study uses EMR data supplemented by qualitative interviews with patients and providers. Health Serv Res. 2016 Feb 3. Ann Emerg Med. 2018 Oct 11. J Psychoactive Drugs. 2017 Dec 04:1-11. Drug Alcohol Depend. 2017 Jun 10;178:170-175. Epub 2017-06-10. J Womens Health (Larchmt). 2015 Jul 8. Ann Fam Med. 2012 Jul-Aug;10(4):304-11. Drug Alcohol Depend. 2012 Nov 1;126(1-2):124-30. Epub 2012 May 26. J Subst Abuse Treat. 2009 Jul;37(1):64-72. Epub 2008 Nov 26. J Subst Abuse Treat. 2008 Apr;34(3):282-92. Epub 2007 Jun 28. J Subst Abuse Treat. 2007 Jul;33(1):43-50. Epub 2007 Jan 16. J Behav Health Serv Res. 2006 Jan;33(1):1-19. Health Serv Res. 2005 Jun;40(3):781-810.